Whirlpool: HR insights from the outside - WorldCity, Inc.
Bridging the gap between the business and human resources side of a company served as an overarching theme at the latest HR Connections, led by Whirlpool’s Antonio Netto, who has spent the past three years as Director of Human Resources in Latin America, after working for 11 years in finance at the company. 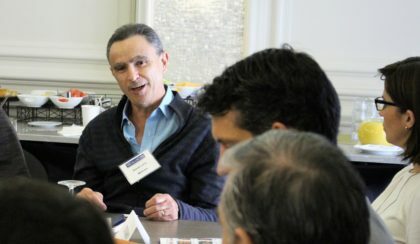 A member of HR Connections holds the program for the discussion led by Whirlpool’s Antonio Netto. Several HR Connections members wanted to know what Netto brought into HR from his previous world of finance and whether experience in HR is attractive for advancement. “For sure. The CEO has a right hand on a CFO and the left-hand on HR,” said Netto. Here are five topics that stood out from more than a dozen questions posed to Netto from a room eager to learn from his multi-departmental perspective. 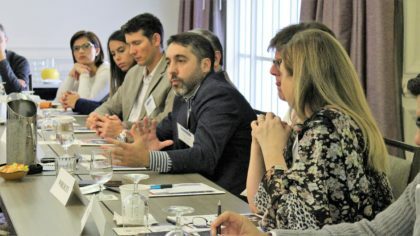 Whirlpool’s Antonio Netto leads the discussion at the latest HR Connections. Millicom’s Daniel Loria shares his opinion that some members of other departments will not be good fits in HR. Nathalie Weister from FOX Latin American Channels shares her thoughts at HR Connections. 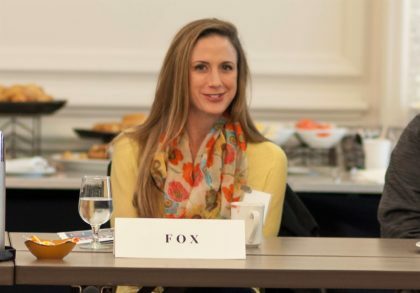 How do you get business leaders to buy into key competencies and training initiatives, asked Nathalie Weister, RRHH Director at FOX Latin American Channels. “What worked was I had face-to-face with the leaders, and I said, ‘Why don’t you guys tell me what you need instead of waiting for us to present to you guys. We don’t know what you need.’ So that really worked,” said Netto. Once the leadership told HR what they were looking for, Netto’s team built the best possible package to build the team. Mario Fernandez Montero from Microsoft explains why he feels HR analytics without insight are not enough. 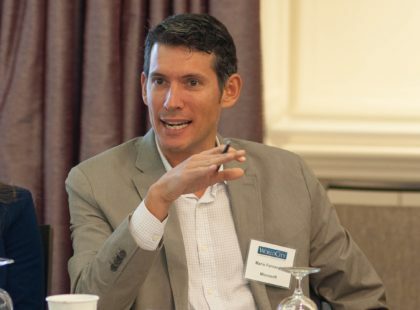 A story on diversity analytics emerged at the discussion from Mario Fernandez Montero, HR Manager for Microsoft Latin America. The analytics showed a positive 40 percent female representation, but within that 40 percent there was a concern. 100 percent of those hires were internal hires. In reality, external diverse talent was not being brought into the business. “That was very enlightening for us. More so than the analytics/data, let’s go more over to insights,” said Fernandez Montero. “It’s the challenge everywhere. Building the numbers, building the analysis, then not having enough time to think about insight,” said Netto. What were the reasons some employees were not a fit after Netto made some changes in Whirlpool’s HR? Geeta Gwalani, TATA Consultancy Services Head of Talent Integration, wanted to know. The biggest reason was the elimination of broad roles in favor of specific ones. If someone struggled with a specific role, chances were given to try a different specific role. Ultimately though, some could not succeed in specific roles. “Sometimes when you have a very broad role, it’s hard to measure performance. After we made the changes, it was easy to see who was performing and who was maybe hiding behind the content manager or whatever,” said Netto. Geeta Gwalani (center) from TATA Consultancy Services explains how her experience on the business side of the company only helped her upon returning to HR. Many at HR Connections agreed sending talent into the business side from HR and bringing them back is extremely valuable. The opposite is also true, as evidenced by Antonio Netto himself. Do not be afraid to bring the best talent from the business side to HR. Either way, success in HR is attractive for advancement. 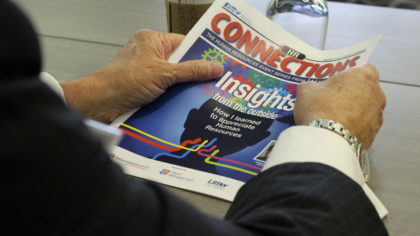 The next HR Connections will take place May 12th. 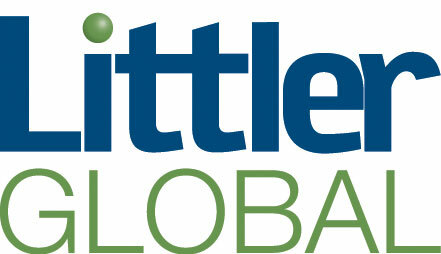 Join us March 31st for WorldCity’s next Global Connections event: Social Media – New Ways. New Customers.